If you’re Italian-American, it’s quite possible your grandmother was given a copy of La Scienza in Cucina E L’arte Di Mangia Bene (Science in the Kitchen and The Art of Eating Well) as a wedding gift, or your mother has a copy on her bookshelf passed down by a relative from Italy. First published in 1891, this book was written by Pellegrino Artusi, the man who has been called the father of Italian home cooking. On a recent road trip through the Emilia-Romagna region of Italy, my husband and I stopped in Forlimpopoli (situated halfway between the towns of Forli and Cesena) to visit Casa Artusi, a living museum of Italian cookery that was created to honor Artusi, one of its most famous citizens. As you approach the town, you can’t miss seeing Rocca Albornoziana, the impressive medieval fortress that overlooks Piazza Garibaldi and anchors the town. Built in the 14th century, it now houses the municipal government, an archaeological museum, and a theater. Just a short walk along a cobbled street from the square, we entered a courtyard to find Casa Artusi, a strikingly contemporary building with glass walls, housed in a structure that once was a monastery. Opened five years ago, its design, both inside and out, stands in stark contrast to the adjoining Chiesa dei Servi, a baroque church containing several important pieces of art. The modern center has a library on the second floor that is open to the public, as well as a research library that holds the 45,000 books that Artusi bequested to the town council upon his death. In collaboration with the Enoteca Regionale Emilia-Romagna, the wine cellar includes 200 varieties of regional wines. Pelligrino Artusi was born in Forlimpopoli in 1820, to a family of traders. He eventually took over his father’s business and traded silks across Italy until he was 45 years old and wealthy enough to retire and focus on his two passions: culture and cuisine. He wrote several other books and then self-published a cookbook of 475 recipes he had collected from friends and acquaintances. Because Artusi never married, the recipes were tested in his own kitchen by his trusted cooks and servants, Francesco Ruffilli and Marietta Sabatini. Filled with witty anecdotes that reveal his wisdom and extensive knowledge of Italian culture, the popularity of Artusi’s book exceeded everyone’s wildest expectations. Through sheer word of mouth, before the era of literary publicists and the Internet, the initial book run of 1000 copies quickly sold out. A later edition including additional secret family recipes, gathered from readers, resulted in a volume of 790 recipes from different regions of Italy. Over the years, the book has been translated into English, German, Spanish and Portuguese. Although the author was well traveled, the book’s recipes are primarily from the regions of Emilia Romagna and Tuscany. That’s because Artusi had to flee from his hometown to Florence in 1851, when Forlimpopoli was penetrated by a group of robbers (Il Passatore) who were after wealthy families, including his own. We had come to Forlimpopoli to learn to make piadina, the traditional Italian flatbread of the region. We could have also taken courses on a variety of other Italian dishes and cooking techniques, including pasta and pastry making. Those who prefer to dive right into eating rather than cooking, can head straight to the lovely restaurant on the ground floor and order from a menu that includes some of the recipes described in the cookbook. We washed our hands, tied on our aprons, and were shown to a modern kitchen with 20 modern stainless steel workstations. Watching the teacher, we carefully measured flour, salt, yeast, water, and lard to create a mound of dough. “Is it always made with lard?” I asked, worrying about all the piadini I had eaten in restaurants on prior evenings. “Some people use olive oil,” my teacher said reassuringly. We were shown how to knead the dough by hand and then roll it out so it was just the right thickness and density before cooking it in a terracotta skillet. 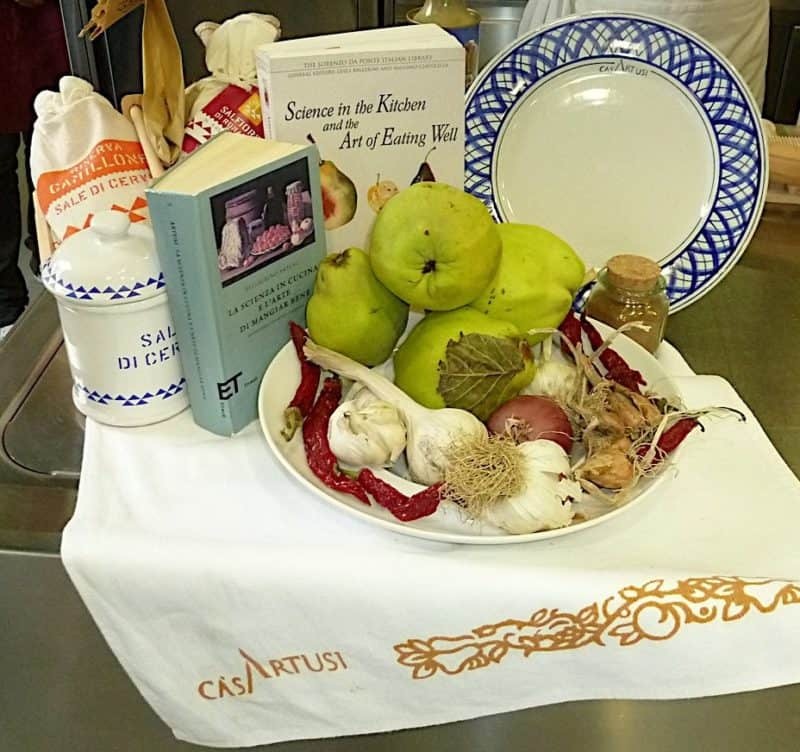 Alongside the teachers at Casa Artusi are Mariettas, members of a modern day woman’s auxiliary of approximately 140 volunteers who assist the professional cooks and students much like Marietta Sabatini did, working with their hands and carrying on the traditions of generations before them. After class, we indulged in the warm, soft bread that was perfectly paired with San Genovese wine, a creamy cheese called sqacquerone, a smooth local ricotta cheese, and Mora Romagnola, slices of tasty salami that comes from black pigs. For many home kitchens in Italy and throughout the world, the book still remains a bible. One reason for its appeal and longevity is that Artusi considered himself neither a gourmet nor a glutton, but someone who appreciated fresh, local foods that were practical and economical to prepare at home—a concept that is still appreciated today. Also, 30 years after the unification of Italy by Garibaldi, Artusi’s book was the first to capture the variety of regional cuisines that comprise what is now referred to as “Italian” home cooking. Forlimpopoli is 78 km from Bologna, 115 km from Florence, 176 km from Venice, 286 km from Milan and 325 km from Rome.